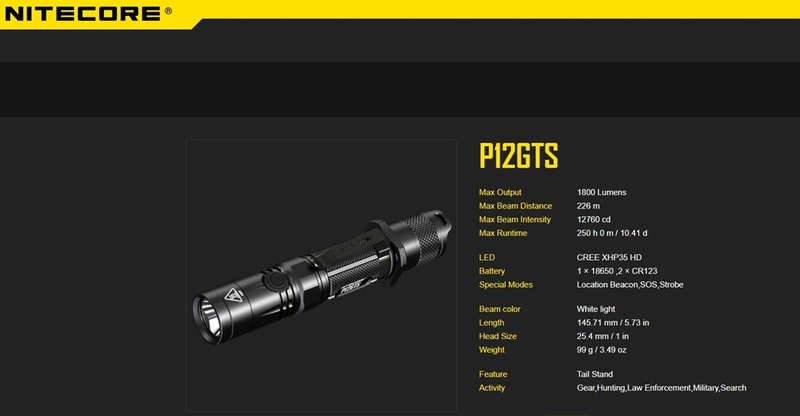 Sent for review by Nitecore . Battery used was a LG 3500mAh capacity high performance NON protected cell . Light output was what I was able to record at the time . 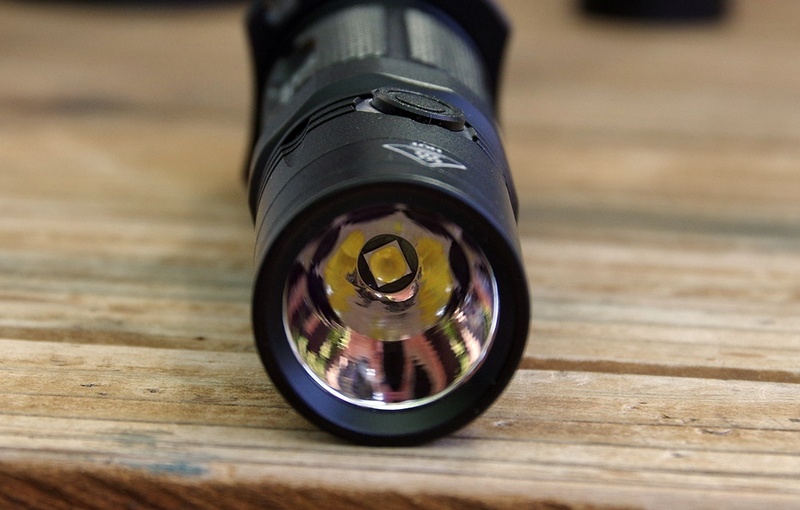 The Nitecore P12GTS is equipped with two switches , a rear clicky for turning the light on and of as well a side switch to change modes . The P12GTS does have mode memory so what ever light level you leave it in , is your starting light level the next time you turn the light on . If you wish you can have to light start in Strobe mode (?) , if you wish . Blinky Modes : To enter the blinky ( Disco ) modes , turn the light on and do a quick double press on the side switch . To change from Strobe to Beacon to SOS , you must press the side switch and hold till the mode changes . If you do a quick press then you will exit the blinky modes into what ever light level you were in . Changing Light Levels : This is an easy one , just turn on the light and give the side switch a quick press . Short cut to Turbo : This be another easy one , what ever light level you are in besides Turbo . Press and hold down the side switch , for as long as you hold down the side switch you will be in Turbo . Short cut to Ultra Low : Ok this one is just a little more challenging . Before you turn on the light press down the side switch and hold , then press the tail cliky to turn on the light . Once on , you can let go the side switch . You are now in Ultra Low mode and as long as you do not change light levels , the P12GTS will re-start in what ever light level the light was set to before you short cut to Ultra Low . If you change modes during the short cut , then the light will start in what ever light level you exit . Momentary : The tail clicky is a momentary one . By this I mean the clicky switch makes contact before the clicky clicks into the ON position . This allows people to do a sort of half press or momentary where by they do not actually click the switch into the ON position . But rather push the switch far enough to make contact . This is a very popular practice by many who simply wish to illuminate something for a second or so . Power Indication : There are two ways of finding out the state of your battery . With a battery inserted and the light off , just give the side switch a quick press . 3 Flashes means you have more then 50% battery . Two flashes means you have less than 50% battery and a single flash means power is bellow 10% . The other way is to unscrew the tailcap and screw it back on . The flashes will now tell you the battery voltage to 0.1v . So for example if your battery is 4.2 volt , the light will give you 4 flashes with a one second pause and then two more flashes . Then lets say your battery is 3.8v , you should get 3 flashes - a pause - followed by eight more flashes . 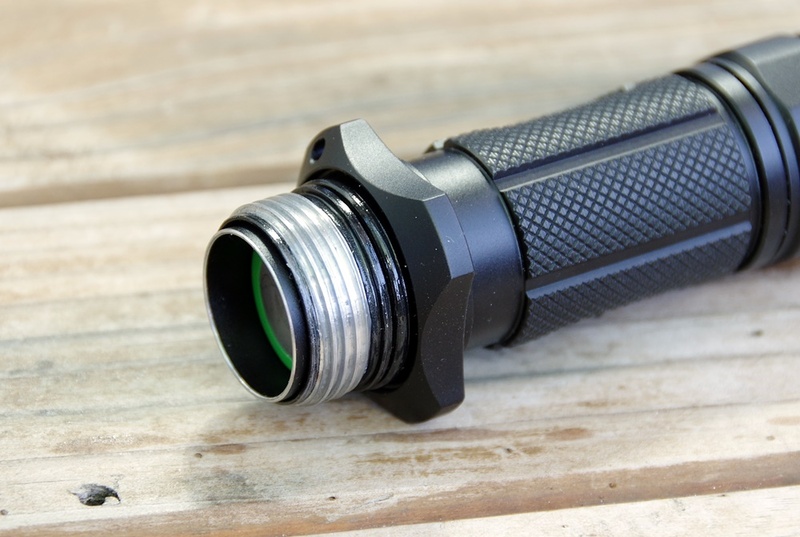 The Cigar Ring : I really like cigar rings on flashlights . They just make holding the light so much more secure , be it bare handed or with gloves on . Especially if it's cold and or wet , it just stops the light from slipping in the hand and makes manipulating the tail clicky so much more secure . Yeah , it's there . 0.06mA measure for 2 minutes . So lets put that in perspective . You would need 16.66 hours to pull one milliamp out of your battery . 166.6 hours to pull 10mA and some 1666 hours to pull 100mA . 1666 hours divided by 24 equals some 69 days . So we are not taking into account self discharge here ( The battery ) . Simply what the light is drawing from the battery when at rest . What the battery does is a whole new kettle of fish . I always take lights for a walk , no matter how small or large they must be taken walkies . From a size perspective the P12GTS is very middle of the road , it is not the longest single 18650 and it is not the shortest . It is for all intensive purposes easy to live with , it enters and exits pockets with the greatest of ease and does not have enough weight to be of concern . I initially thought the small reflector / head might mean a small or overly floody beam , but no ! It does not carry a hot spot like some more throwy lights , but then I don't think the P12GTS was ever meant to be throwy . What we get is a very useful beam profile out to say 100 meters and a beam you can live with inside a house . Anyhow , I really like the shortcut to Turbo . 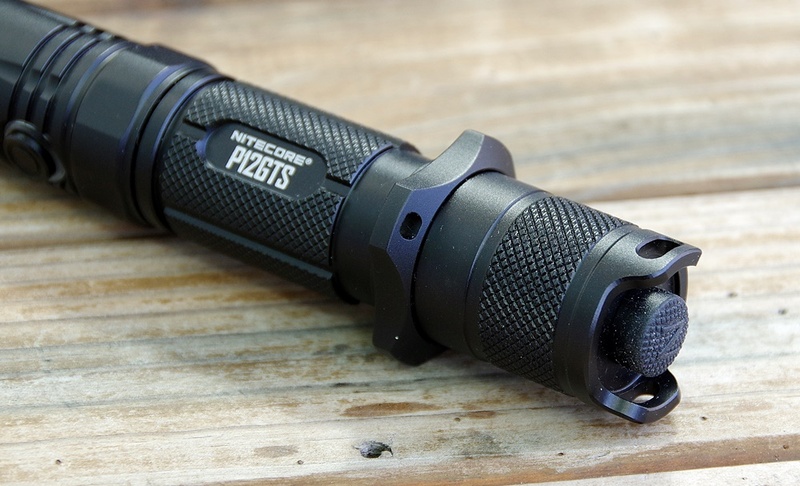 Generally I like to walkabout with about 80 Lumens ( and that's what the P12GTS delivers ) and when I need to see more or I want to be seen , one simply presses and holds the mode button for 1800 Lumens ( That is so sweet ) . Car drivers here tend to be some what tardy ( STUPID ) when it comes to giving way to pedestrians ( who have the right of way ) and that 1800 lumens being just a short press away is very comforting . 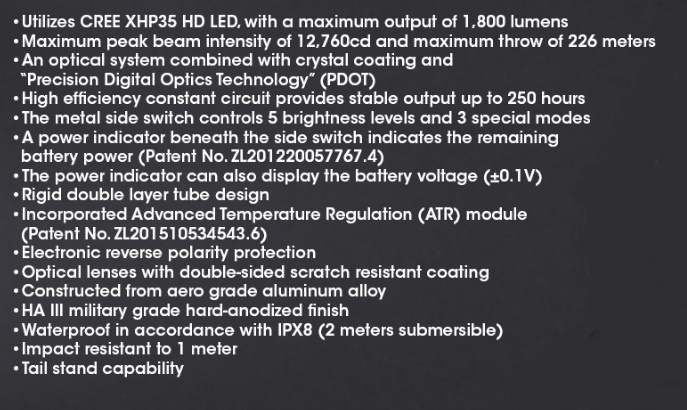 Ok not quite as comforting as say a main battle tank , but certainly one can be assured that 1800 lumens is not something that is not going to be seen . It also comes in real handy when trying to avoid dog left overs on nature strips if you need to walk on the grass . 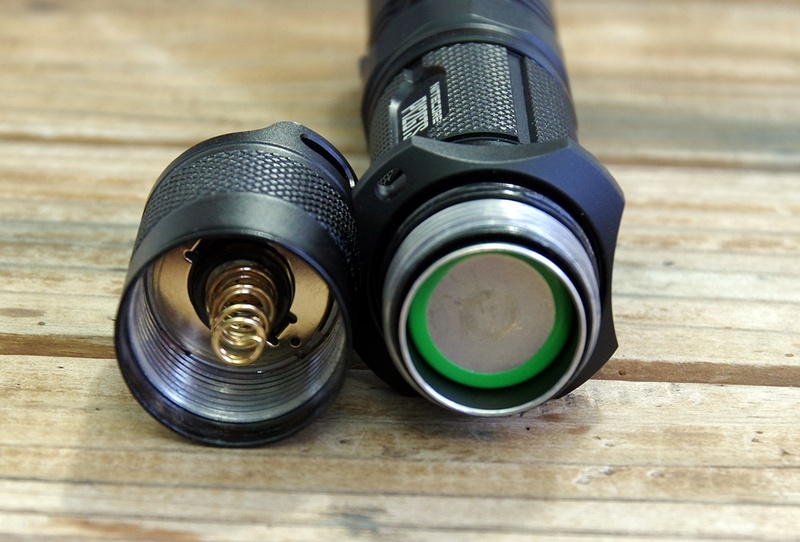 I am very quickly becoming a side switch fan , the simplicity of use and the lack of need to change ones grip to change light levels is a serious bonus for anyone that takes a flashlight walking . I also like the fact that I can turn on or off the light as quickly as I like without changing light levels . ( Since the tail switch does not change light levels ) . I am not sure how many years it is now since my first Nitecore , but there is one constant that has not changed in all that time and that is simply that Nitecore makes a quality product . When it comes to the threads , O rings , anodizing , the clicky switch , there is just nothing to complain about in regards to build quality . The only possible negative the P12GTS might carry into battle is the small amount of parasitic drain that is needed to monitor the UI . For anyone that takes their lighting solution seriously this is not going to be an issue and the main reason would be that every time the light goes on duty it does so with fresh batteries . I mean , does it matter what light you use ? Because personally I would be stuffing in a fresh battery at the start of any shift where I would need to rely on a flashlight . And for the home owner ? Seriously , 69 days for 100mA . I am using 3500mAh LG and to really impact on this battery I would say you would need to pull at least 1000mA out of it , or 10 times 69 days . So lets put parasitic drain to rest for now and just call it the price we need to pay for a nicely featured light and if we need to charge the the battery once a year ? What we are left with is , well ... Nothing to really complain about . Ok lets be realistic , some one will always find something to complain about and that's just reality . Personal preference is just that , but bare in mind the P12GTS does what it was designed to do and it does it well . There is nothing confusing about the P12GTS , it makes no attempt to be Tacticool , it simply performs well . Is there an argument for the P12GTS to be made that it is tactical , from my perspective very much so . 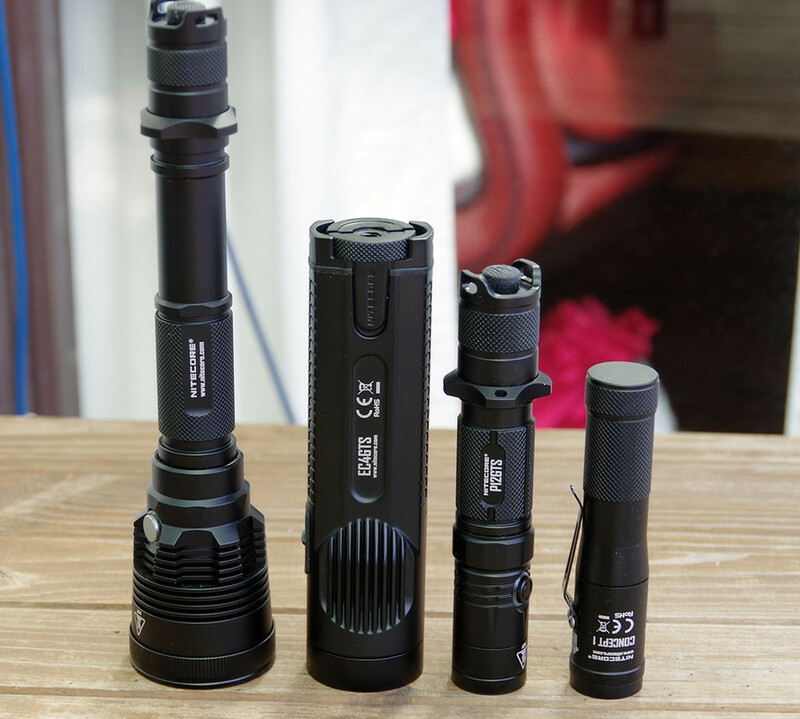 Should law enforcement / security / fire / ambulance / Homeland / FBI / EPA / IRS / Border Security / or anyone else that needs a good flashlight be looking at the P12GTS , yeah they should ! Since the P12GTS will run on primaries and a lot of agencies still use them , I really think the P12GTS is worth a serious look . Power / reliability / quality / simplicity / and a excellent power to size ratio , the P12GTS has to be a contender . For me the P12GTS is a 10 out of 10 light and I am sure it will make any prospective owner happy . Heck , I like it so much I am putting the P12GTS into my main rotation of lights , in fact I think I need to pull some out . ( I just counted - I have some 14 lights within easy reach ready to light something up . That might be 2 or 3 too many ) . 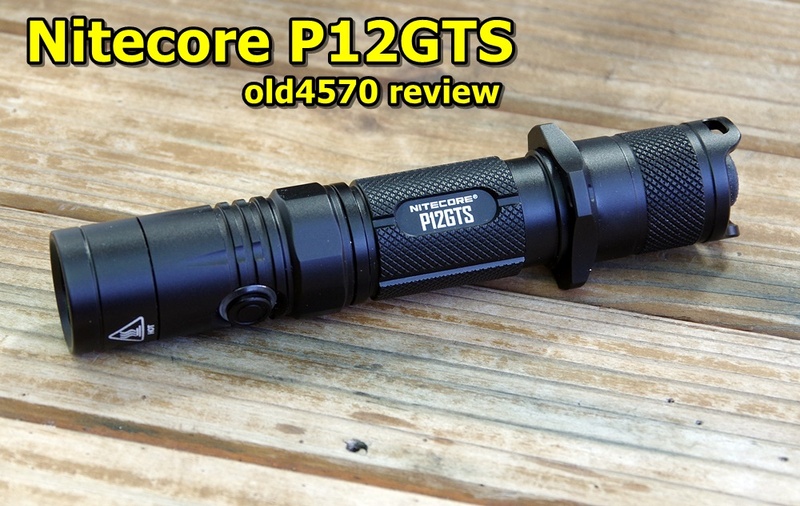 I would like to thank Nitecore for sending the P12GTS for review , it really has impressed me .